Sift together flour, cumin, curry powder and baking soda in a large bowl. Make a well in the center and slowly add 1 cup of warm water. Mix with your hands until a moderately soft yet workable dough forms. Flour your work surface and knead for 8-10 minutes. Place dough in a bowl and cover with a damp cloth. Rest for 15-20 minutes. Divide the dough into 8 small balls and flatten them with the palm of your hand. Place dough back into the bowl, cover with damp cloth and rest an additional 10 minutes. Do not stack the dough. Dust your work surface with flour. Roll one ball of dough into a 4 inch circle. 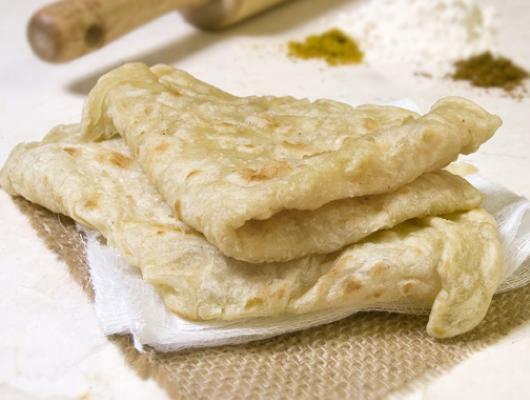 Rub ¼ teaspoon of vegetable oil onto the dough and sprinkle with a pinch of flour. Fold the dough into thirds, rubbing oil on top of each fold. Ensure not to press hard on the dough when folding as you want to keep air between each layer. You should now have a long piece of dough folded onto itself twice. Loosely roll it up so it looks like a croissant, oiling the dough as you go. Coat the dough in another ¼ teaspoon of oil and place on a flat surface covered with the damp cloth. Repeat until all the dough has been folded and rolled, rest for 10 minutes. Heat 1 tablespoon of vegetable oil over medium heat in a cast iron skillet or a tawa if you have one. Flour your work surface. With a rolling pin, flatten the dough into a four inch circle. Place the dough into the frying pan. A trick to I discovered to flaky roti is to constantly turn the dough as it cooks. Use a spatula to hold down the edges as you rotate, ensuring not to press down on the centre. After 10 seconds turn the roti and continue to turn. Toss it back and forth every 10 seconds for about two minutes until it has puffed up and light browning begins to appear. Now comes the hard part. Traditionally, when the cooking is complete, you quickly pick the roti up with your bare hands and clap it between your palms to remove the air. It takes a lot of practice to get this right and it hurts! I did this process wearing oven mitts, and I recommend doing the same. Place the cooked roti in a colander with a piece of damp paper towel on the bottom. Cover the colander with the damp cloth. Repeat the process until all your roti is cooked. Eat immediately. 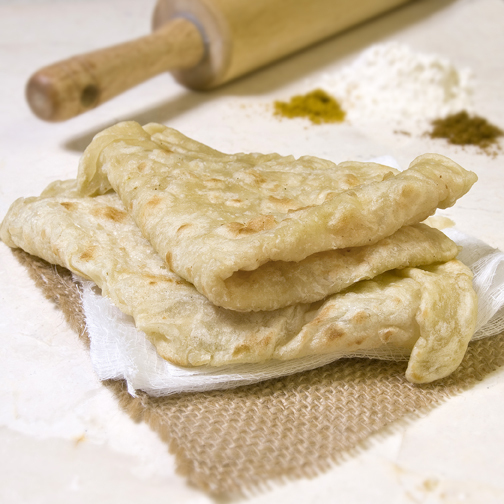 To store roti, place it between damp paper towels in a sealed container in the fridge. To reheat it, cover the roti with a damp paper towel and microwave for about 30 seconds. The damp paper towel helps it to stay moist.